What exactly is rheumatoid arthritis (RA) and what can be done about it? Rheumatoid arthritis is the most common cause of autoimmune arthritis. It is characterized by inflammation in joints created by the immune system. Usually the immune system helps a person fight off infections, but in the case of RA, it attacks the joints and other tissues. The cause is unknown. The only way to reduce one’s risk of getting RA is to avoid smoking. How can a person find out if they have rheumatoid arthritis? Typically, RA patients experience stiffness, soreness and swelling of the joints of the hands and feet. Other joints and the neck can be involved. Morning stiffness typically lasts at least a half hour. RA can also lead to fatigue, dry mouth, dry eyes, and numbness. Rheumatologists – physicians trained in musculoskeletal and autoimmune diseases – can ask detailed questions and order lab tests, x-rays and other tests to make a diagnosis. This evaluation can distinguish RA from more common “mechanical” joint pains (wear and tear, injuries, and overuse) and other ailments such as lupus, fibromyalgia, gout, carpal tunnel syndrome, and Lyme disease. 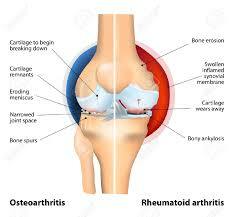 Overall, rheumatoid arthritis is a very treatable disease. Specialized medications used in a “treat to target” strategy can prevent joint damage and disability. But there is no known cure for RA. It is hoped that future clinical research will identify not only new medicines, but also tools to predict which treatments will work in each specific person, and when medications might be stopped without risking recurrence of the disease.